Get the current freetz-source from their website or the corresponding freetz-1.2_rc2.tar.bz2 (checked out at 2012-03-21) from my webspace for the patch. install the freetz-1.2_rc2.patch or use my precompiled Image for the FritzBox 7270v3 (english) or my precompiled Image for the FritzBox 7270v3 (german) (Read Information further down in text). compile source, set up firewall/qos rules. Sometime in 2010 I've had patched the freetz source to add mainly two schedulers (cbq, htb), the u32 filter and a working tc (traffic control) binary. Those are common for QoS in Linux for throttle or managing your bandwidth on a special source/destination addresses, ports, ip protocols or any firewall marks. the corresponding freetz-1.2_rc2.patch files (usage is in the comments). the kernel config file for this precompiled image (english). Should work for everyone. I've enabled dropbear (ssh), nfs, ntfs, ext3, fat32, network scheduler (cbq, htb, llq, sfq, prio), network filters (u32, fw) and for iptables (conntrack, xt_mark, masquerade, mangle, filter). 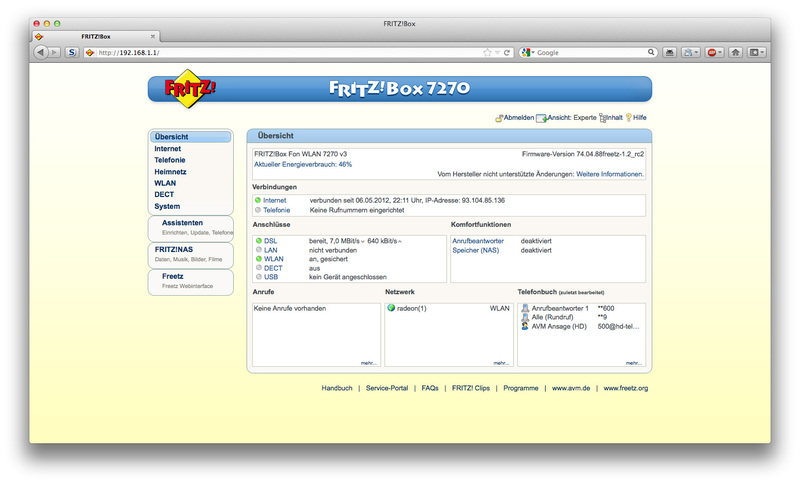 my build freetz image for the FritzBox 7270 v3 (english) Contains freetz 1.2_rc2 and the avm firmware 74.04.90.
the avm firmware itself, Fritzbox 7270 v3 - 74.04.90 (english). the kernel config file for this precompiled image (german). It should work for everyone. I've enabled dropbear (ssh), nfs, ntfs, ext3, fat32, network scheduler (cbq, htb, llq, sfq, prio), network filters (u32, fw) and for iptables (conntrack, xt_mark, masquerade, mangle, filter). my build freetz image for the FritzBox 7270 v3 (german) Contains freetz 1.2_rc2 and the avm firmware 74.04.88.
even if you've loaded the proper kernel module. qdisc (queueing discipline) is elementary to understanding traffic control. Whenever the kernel needs to send a packet to an interface, it is enqueued to the qdisc configured for that interface. Immediately afterwards, the kernel tries to get as many packets as possible from the qdisc, for giving them to the network adaptor driver. We use classful htb in this script. The htb qdisc, or hierarchical token bucket, is a classful shaping qdisc. It packs a lot of flexibility and has numerous options available. It calculates reasonable default values for anything you do not specify, which is generally fine. And it's a lot easier to use than cbq. This is the leaf class 1:10 attached to the root class 1:1. Shaping can be done in the leaf class not in the root class. In this example of leaf classes, we allocate 1512kbit,4mbit and 2mbit of bandwidth to each class respectively. rate: guaranteed (minimum bandwidth) which can be exceeded. Now add a handle with fw marks. We can tell iptables and thus the kernel to mark special packets (like all packets that go or come from a defined host). We use filters to classify the packets into an output queue and attached it to our classful htb class. What the fw handle means will be meaningful in the rest of the example. SFQ (Stochastic Fairness Queueing) is added to each of the HTB queues and it offers equality for limiting traffic while keeping the overhead low. quantum: Amount of bytes a flow is allowed to dequeue during a round of the round robin process. Defaults to the MTU of the interface which is also the advised value and the minimum value. This is what manual says but I have seen that default value is assigned as 814. So maybe it is better to set it to 1500.
perturb: Interval in seconds for queue algorithm perturbation. Defaults to 0, which means that no perturbation occurs. Do not set too low for each perturbation may cause some packet reordering. Advised value: 10. In this script we direct hosts having IP addresses 192.168.1.21,31,32 into different classes each of which has different rate. Important thing is that ath0 interface is the inner interface of the Fritzbox. For example if host 192.168.111.2 is downloading a file from a remote host, ath0 becomes an egress interface for the packets coming from the remote host. If we want to limit what these hosts send another qdisc for adsl (outside interface) and root,child classes must be added. Take a look here for more information about queues, the filter options and classes. You get information about using tc and the u32 selector, using the netfilter CLASSIFY target and also about the different qdiscs like htb, cbq (classfull), sfq and prio (classless). Thanks for giving thoughts on creating this example here. You can cleary see here, that the adsl device is the outer device and ath0 the internal wifi device. 1st of all, this patch works like a charm on freetz/fritzbox7170. I use it to shape my upload bandwidth on dsl interface. I can't slow down dsl interface anymore! Nice to hear you've had success with your FB7170, since you are the first one to comment =). So maybe more people give it a try now! I've no clue about your problem on the FB7340 since i still use my 7270, but i'll look into it, maybe i can come up with something, ..
Hunk #1 succeeded at 992 with fuzz 2 (offset 627 lines). Hunk #1 FAILED at 26. Such errors usually come up if you chose an improper level for patching. The '-p' option instructs patch to ignore parts of the path name so that it can identify the files correctly. Thats necessary, because within the patch files the files to be patched are identified by path names which may be different on your computer rather than on my one where the patch was created. Just make sure you have the patch file in the root directory of your freetz source. Nice article and very helpfull! I'd love to limit bandwidth for one computer. I am using a fritzbox 7270 v2 and v3. While I tried to compile the latest trunk with your patch for the 7270v2, it was compiling after a few changes but when I tried to enter even one command, then the Fritzbox is rebooting without any reason. I used your precompiled freetz image and after a few "tc" commands the same thing happens...I'm really scared to enter commands, cause I never know when it "crashes" and reboots. Hi, I am not sure I understand, the freetz packages doesnt contain /make/iproute2 package, where can I get it? See the patch file, i've added a build script and my server as a mirror for a working iproute2 package. I've tried several one, newer ones didn't build for me. Very interesting and useful article! If someone wants to code a universal freetz webinterface (not an easy task) join our irc channel ##fritzbox on freenode.net (yes two ##). Best idle there until someone can help. Some freetz coders hang around there too. Hello I've been using 1.0.4.31 version and was wondering how I can go the the latest one? Is there any instructions? Export your blog urls using the settings option. Already downloaded binary files will not be re-downloaded if they are still at the same place or if you change the download location in the details window to match the location to the new location of your files. Hm, I am a bit lost. Settings option? Where is it?